When you can climb walls and swing between buildings, do you really need a car? In 1974 Marvel’s writers thought Spider-Man did, so they gave him a dune buggy that he could use to sit in New York traffic for hours. 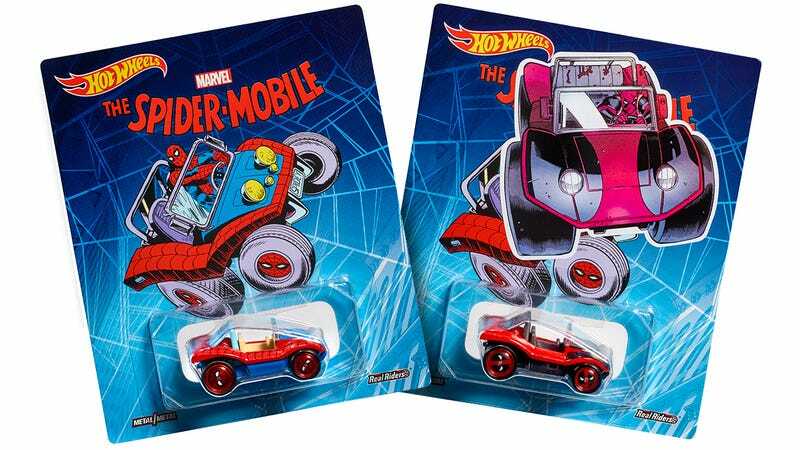 As weird as it was, it’s a memorable piece of Marvel history, so Hot Wheels is bringing it back as one of this year’s San Diego Comic-Con exclusives. Available on the Comic-Con show floor for $15, the 1:64-scale Spider-Mobile features real rubber tires and hubcaps emblazoned with Spider-Man’s face. But fans of the superhero might not find exactly what they were expecting once they open the collectible’s packaging. One out of every five Spider-Mobiles will instead be a Deadpool-customized variant of the vehicle called the Dead-Buggy, complete with merc-with-a-mouth hubcaps. The toy’s packaging will even come vandalized with Deadpool artwork, and a letter from Wade Winston Wilson explaining why you’re better off with his variant instead. Most collectors at Comic-Con will be happy to find they’ve scored the Dead-Buggy instead of the Spider-Mobile given the limited run of these toys, and the apparent scarcity of Deadpool’s version. But if die-hard Spider-Man fans are genuinely upset to find they didn’t get Spidey’s ride, they should have little trouble finding someone to trade with on the Comic-Con show floor, or someone willing to shell out a premium for it on eBay.